I, for one, was not enticed by the prospect of Frost/Nixon, a cinematic rendering of Peter Morgan’s play of the same name which dramatised the now-famous series of interviews which the disgraced former US president Richard Nixon gave in 1977. My objections were twofold: firstly, I generally dislike film adaptations of theatre productions, finding the majority of them to lose much in translation between the wooden boards and the silver screen. Secondly, and on a related note, there seemed to be something inconsequential about what took place in those interviews: certainly, the eventual candid admissions of the former president were unprecedented, but did they really change anything in the historical record, or undo the wrongs of his terms in office? Amazingly, I found my reservations were mostly dismissed in the course of the film. Peter Morgan’s screenplay, much like last year’s excellent Man On Wire which constructed itself akin to a classic heist movie, finds cinematic terms with which to approach the subject. In Frost/Nixon‘s case what surprisingly emerges is something like a Rocky film: the plucky underdog going several rounds on the ropes against a dogged, seemingly impermeable villain before against the odds landing a series of killer punches to nail his opponent. Along the way, there is a real sense of drama, despite the apparently low stakes. What drives things along are in fact three competing poles jostling for position. Firstly there is Nixon himself, frustrated at his political and personal exile, who sees the interviews as a chance to rehabilitate his public image and to exonerate himself of his crimes. On the other camera is David Frost, a semi-successful TV presenter looking to use the interviews as a springboard to raise his international fame, and to work on bigger more glamorous projects. And then there is the third influence, less visible but clearly behind it all: the people who wish to see Nixon brought down once and for all, demanding at the very least an admission of guilt for his actions over Watergate, Vietnam and Cambodia. Substitute the words ‘Bush’ and ‘Iraq’ in there, and see how little has changed in thirty years. Ron Howard is not a director who I massively admire, but he manages to control the pacing and flow almost impeccably. The casting is first-rate: Langella excels as the browbeaten passive-aggressive Nixon, while secondary roles for Sam Rockwell, Kevin Bacon and Matthew Macfadyen support the leads ably. Strangely, Michael Sheen’s superb performance as David Frost reminded me of what Anthony Hopkins managed to achieve in the lead role in Oliver Stone’s Nixon (1995), in that he managed entirely to convince me that he was the character he was portraying without either going overboard in trying to resemble him physically nor descending into caricature. There are unavoidable touches of his Tony Blair there too, in particular that Cheshire Cat grin, but also something of the Steve Coogan about him – at first we see his Alan Partridge-esque bumbling TV persona, but later as he gets more entrenched in the project there is the Tony Wilson of 24 Hour Party People, slowly realising that he has stumbled across something bigger, and more important, than himself. Ultimately, one’s interest in the film hinges on whether one considers the subject of Richard Nixon as at all fascinating; I am interested in the period because I think it marks a turning-point in attitudes towards the US presidency, permanently soured after the relative high-points of popularity enjoyed during the Kennedy and Roosevelt administrations. 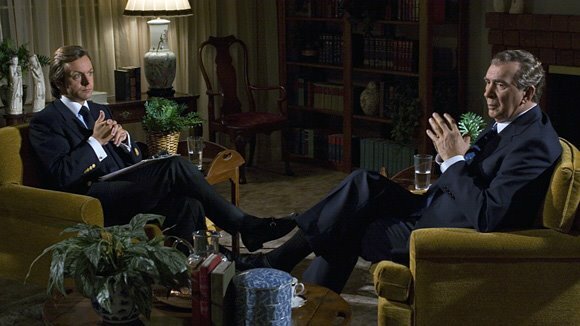 What I took from the film was a sense that after the Frost-Nixon interviews politicians would never be viewed the same again, which has led us up the path to the spin-centred politics which we are presented with now, where television is a more important a weapon of political control than a rifle. Nixon should have known this: after all, as we find out, it was his sweaty lip which cost him the 1960 election.